I’m a pretty frugal person. Before I began personal training, I’ll admit that I didn’t see the value in personal training. However, now that I’ve been a client of personal training, I see firsthand how the benefits make this frugal person want to invest in personal training! So what is personal training? Personal Training consists of a one-on-one sessions with our expert trainers. At your Personal Training assessment, measurements will be taken of your desired areas after which an exercise regimen will be tailored to your specific Wellness goals. Don’t make my mistake— Don’t underestimate the value of Personal Training! When I can’t self-motivate, it helps to know there’s someone I’ll have to answer to—someone who will ask how I’ve been doing with my exercise habits outside of personal training. I personally find that it helps for me to schedule my personal training appointment once a week so I have that weekly accountability. The beauty of personal training, though, is that it’s all up to YOU! If you want to be trained 3 times a week, twice a week, or just once a week— you can set it up whichever way works best for you. If you need some direction, you can talk to your trainer about your goals and they can recommend the frequency that would best help you achieve your goals. I wish I could say I was as diligent with exercise as I am my money, but the truth is I’ve never been consistent when it comes to fitness. I can’t count the times I’ve said to myself, “I’ll start working out tomorrow” — and never followed through. Yet, when I know I have an appointment scheduled for personal training, I’m sure to keep that appointment. Granted, I have a long road ahead of me as I have very little upper/lower body strength, I always find I can do more than I realized I could when I have an expert trainer coaching me in real time as I’m performing an exercise. This should be obvious. I’m going to share with you why I think it’s overlooked. Those of us without the education in exercise physiology don’t always necessarily understand when we’re not using proper form. We might see an exercise and copy it to the best of our ability, but unless we’re firing up certain muscles, what’s the benefit?? Or worse— are we doing more harm than good? I mentioned I have zero upper body strength, right? Early on in my training, I was starting off small by doing wall push-ups. I felt like I was knocking them out of the park, but the third one in, my trainer corrected my form and I could suddenly tell why it was so “easy” before—I was doing it wrong! If you’re like me and you don’t look forward to working out, personal training has a way of keeping things interesting. 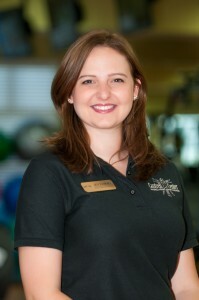 Each Cantrell Center Wellness Trainer has their Bachelor’s degree in either Exercise Science or Exercise Physiology. Though they all have education and experience, each of their training styles is different. You can bounce back and forth between them for added variety or choose to stick to one specific trainer. Either way, when you’re given new exercise, it helps you see how far you can push yourself. When trainers have you revisit an exercise you’ve done before, it shows you how much you’ve progressed in a tangible way! Frugality is defined as “the quality of being economical with money; thriftiness”. Would you still consider me frugal though if I opted to buy a $10 pair of shoes instead of a $40 pair, but had to replace them 6 times as often as I would have the $40 pair? My point is that sometimes you spend more money on the front end for a greater benefit in the long term. That’s called an investment. Invest in your fitness and health by purchasing a personal training package and you’ll reap benefits in your individual workouts, group fitness classes, and just life in general! How often do you treat yourself to an iced coffee or shake every now and then? The “benefit” to that is so temporary; whereas, the investment in your health can last a lifetime. Can you really put a price on having more energy, a thinner waistline, and a lower risk for a host of illnesses and diseases? 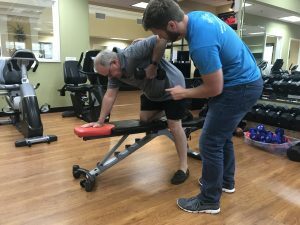 The Personal Trainers here at the Cantrell Wellness Center can take your workout to the next level with their helpful tips, correction of form, and motivation to push through to your optimum level of exercising. 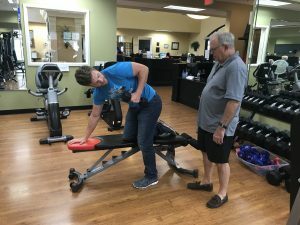 To find out more about our expert trainers, please visit: https://www.cantrellcenter.com/wellness-program/wellness-team/ For pricing, visit https://www.cantrellcenter.com/personal-trainers/ or give us a call at (478) 333-6777! As Wellness Administrative Supervisor, Jen Zamora manages the wellness admin. team, keeps the website and Facebook updated, and is heavily involved in preparations for the annual Cantrell Center 5K. Jen is married to Gabriel Zamora, who moved here in 2010 from Venezuela. She is bilingual and enjoys conversing with Spanish-speaking patients and members when she can. When not working, Jen enjoys making jewelry and scouting out the local Goodwill for fabulous finds!